The Pioneer X-CM32BTD is no longer available. The Pioneer XHM26DB may be a suitable HiFi system with DAB. The Pioneer X-CM32BTD is a versatile CD receiver system with DAB/DAB+, FM and a host of other inputs. Available in black or white the system includes two speakers with 94mm cone woofers and 50mm cone tweeters. The system has a power output of 15W + 15W which is fine for many living and dining rooms. If more power is required the Pioneer X-HM51DAB packs 50W + 50W but with virtually the same inputs and similar features. The simple design urges you to turn up the large, silver volume control. Most functions are managed through the remote control which is a little crowded. Functions are given their own buttons though, so setting a sleep timer or changing the brightness of the display doesn’t require searching through options and menus. 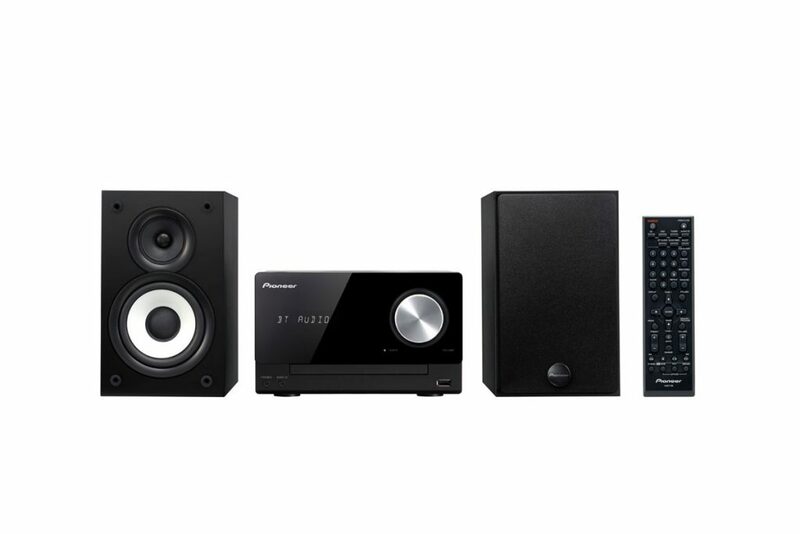 Where the Pioneer X-CM32BTD really plays its trump card is with its number of inputs. Many small hi-fi systems offer one or two input options, pushing you above £200 for a small Denon-like system when you would like more. A simple 3.5mm jack input is available on the front of the unit, allowing connection of almost any MP3 player, smartphone or even laptop. A RCA line-in connection is offered on the rear, useful for an external device like a turntable with built-in phono stage. It’s possible to listen to music, podcasts and other content from an iPod, iPhone or iPad via USB, and those devices will be charged in the process. Bluetooth is also available – remembering all the devices which are connected so you don’t need to pair them again. When a Bluetooth standby mode is enabled the hi-fi can even be powered up remotely. The Pioneer Wireless Streaming App takes Bluetooth a step further for iOS and Android devices. The ‘Advanced Sound Retriever’ offers an extra level of control with an 8-band equaliser, tempo control and ‘club sound boost’. And if the kids are in control of the phones and tablets you can still stick on a CD. Verdict: The X-CM32BTD receiver system won't leave you short when it comes to sources of audio, with DAB/DAB+, FM, CDs, USB, Bluetooth, iPhone and line inputs.